Truthful Tuesday, March 9, 2010! This is my beautiful daughter who is about to be 5 years old on the 10th of March. We just had her 5th birthday party on Saturday, with all of our friends and family. Her theme, completely of her own choice, Moulin Rouge. Yes, that is right, my 4 year old chose for her theme….Moulin Rouge. 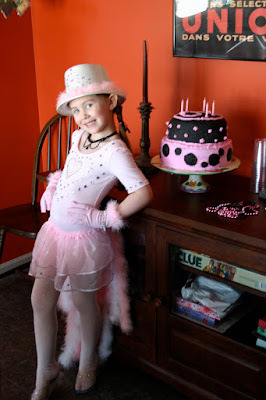 The entire party was done in pink and black , complete with pink and black cake…made by Daddy, as he does very year. The Pink Diamond costume was made by Grandma and Bella was tickled pink, pardon the pun. It’s amazing how easy it is to make children happy. I love her smile and will do absolutely anything in the world to see it. All was moving swimmingly until she was opening gifts, such an innocuous thing. I was taking photos and it was like she was literally growing up before my eyes. All I kept thinking was, hold on a minute….slow down, wasn’t it just last year when you were eating cake for the first time on your first birthday? Then she’d say something so grown up like, “Oh my gosh, thank you all so much. I wasn’t expecting so many gifts!” Then, she got to the gift from us. She squealed with delight and then…. she opened the card. I had purposely gotten her a musical card, her and her little sister are simply over the moon for those cards.This it what it said; “Imagine a perfect day, where happiness and love feel as bright and warm as the summer sun and all the dreams in your heart come true…and you’ll know what its like to spend a day loving you!” Obviously, I know the card was meant for a couple but the sentiment was so perfect. She opened it and it played “It’s a wonderful world” and I about lost it. I was all in hysterics (on the inside). I was holding back tears and biting my lip, while snapping photos. When all I really wanted to do was go over and give her a big ole snuggle and keep her in that moment…forever. She was so happy and over joyed in that moment.She thought it was awesome and was thrilled that I had gotten her a card that made music,never mind what the card said. NO, the contents of what that card said and the message I wrote in it will all mean something much more important to her in 20 years or so.There is nothing so magical in the world as seeing your child genuinely happy and smiling their “real” smile. Her actual birthday is Wednesday and we will be celebrating Bellapalooza in style, as we always do. It is one of the most important days of my life and I think it should be celebrated and commemorated. I feel like it is my birthday too, as it is the day I became a Mommy.It is the day I was born a Mommy! In that moment when I first held her, I was transformed and changed forever. Happy Birthday , my beautiful amazing princess! Happy Birthday to your daughter – she looks fabulous in her Moulin Rouge outfit and your husband is a master cake maker, very impressive. I hope you have a wonderful day. They grow up so fast don't they? Like you I want my daughter to grow up as I am looking forward to sharing all the ages and stages with her, but I wish she would grow up a little more slowly (that would of course also mean I age a little bit more slowly too!). I LOVE her theme choice…you sure she isn't my kid? What a doll! Thanks Ladies! Bella had a wonderful birthday party and birth day, a lovely birth minute kiss and ..as I said, it was Bellapalooza! A week long celebration of my Bella. Now, we are gearing up for Gabipalooza…to be coming up in May! They really do grow up too fast!